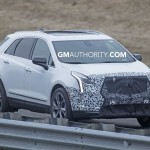 New spy shots seem to show a refreshed Cadillac XT5, potentially for the 2019 or 2020 model year, but we think there may be something more going on here. While the body is undeniably an XT5, this doesn’t appear to be an ordinary mid-size crossover. Foremost, the wheels are gigantic for the test mule, which gives it an incredibly tall stance. Secondly, the entire body is shorter than the exhaust itself, which results in the protruding exhaust tips and mufflers. 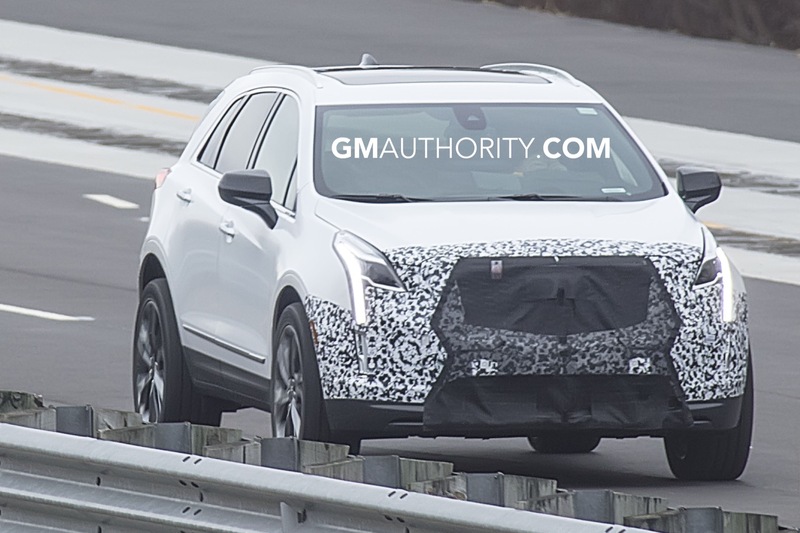 We also think there’s a good reason that only the front and rear bumpers boast camouflage – as this could very well be a test mule for a Cadillac crossover larger than the XT5. Supporting our hypothesis is that Cadillac has had plans for a crossover above the XT5. 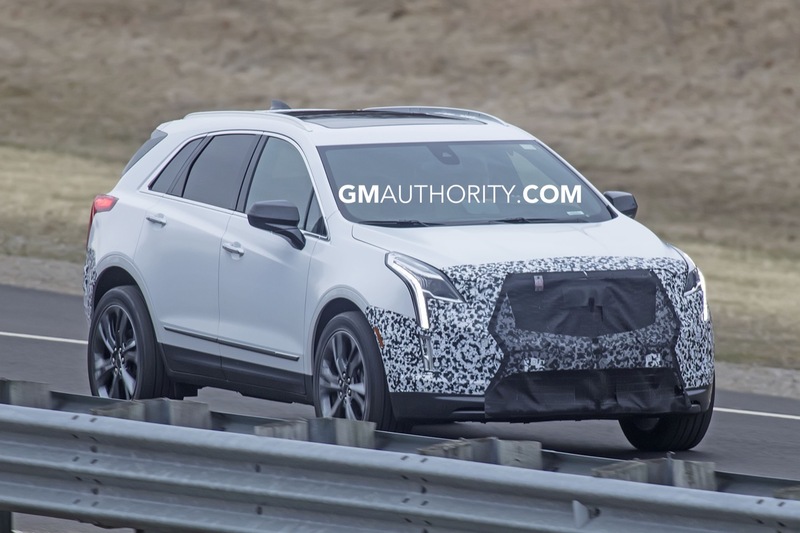 Rumored to be called Cadillac XT6, the model will slot above the midsize XT5 and likely ride on the extended-length version of the GM C1 platform. The regular-length version of the architecture currently underpins the first-gen XT5, second-gen GMC Acadia as well as the upcoming future Chevy Blazer. Meanwhile, the extended-length version of the C1 architecture underpins the second-generation Chevy Traverse and Buick Enclave, which are full-size models. As such, we could see the rumored XT6 being positioned as a “midsize plus” crossover with three rows to take on the likes of the Lexus RXL, Infiniti QX60, Volvo XC90 and Audi Q7 – a strategy that would still leave room for a larger and more expensive crossover to rival the likes of the Mercedes-Benz GLS-Class and BMW X7. 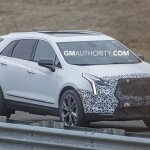 Supporting our idea that the vehicle seen here is not an updated XT5 is that it does not feature Cadillac’s new design language previewed by the Cadillac Escala concept. Meanwhile, the design of the upcoming compact 2019 XT4 and refreshed 2019 CT6 will be heavily influenced by the Escala. By comparison, this tester wears identical lights to the to the current XT5, albeit the grille is covered up. This is our first sighting, so we’ll have to wait and see if this particular prototype surfaces again, though it could come up in a different body in the near future. 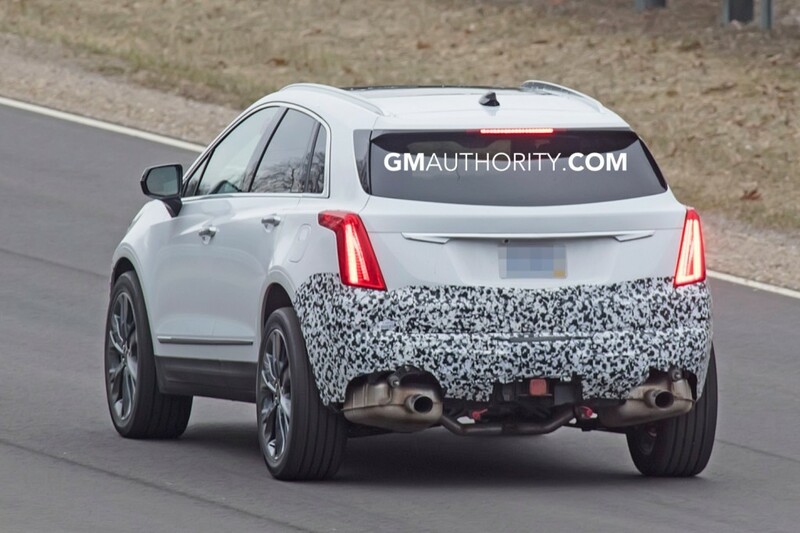 Curious, if this is an XT6 mule why put an XT5 on body over the under linings and comoflodge only part of it? Also, the mufflers only stick out a little bit. Wouldn’t there be a big enough difference in length between the XT5 & XT6 to have more exhaust sticking out? The more I look at this, the more I say it is a test mule. The wheels are huge, the exhaust sticks out about 6 inches too far, and even the track looks wider. Check out the rear 3/4 shot. The wheels are out past the wheel wells. Now the question is, what model is this the base of? At first, I thought larger 3 row SUV. 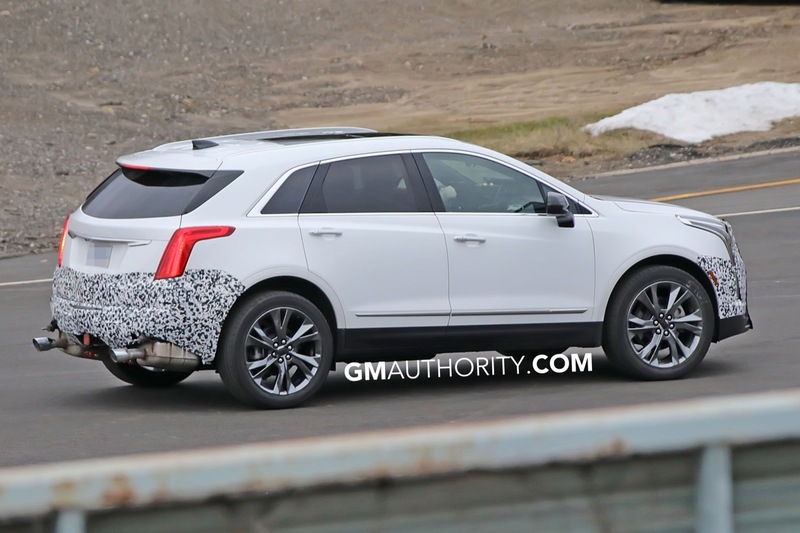 However, given how much larger XT4 is shaping up to be, I wouldn’t be surprised if this is a replacement to XT5. XT4 is looking to be priced in the BMW X1 area, but sized like the X3. XT5 is currently smaller than BMW X5. Maybe this model will be the replacement that is larger than XT5 in order to have a better gap between the XT4 and XT5 and bring in JDN and Escala influence more quickly. The new model could compete with BMW X5 and GLE directly, and perhaps be called XT6, leaving the full size, 3 row XT8 above it. Even numbered XT models could denote typical crossovers, leaving odd numbered XT models to denote possible coupe like SUVs. The other option is that this is indeed the rumored 3 row crossover Cadillac. 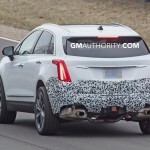 There will be a lot of spy shots coming from Cadillac over this next year. The XT5 is not getting a redesign that quickly since it only takes 5-6 years out for a complete makeover. This vehicle is being use as a test mule for XT6 most likely. Besides, the XT5 is relatively new since it has been out less than two years now. BMW introduced the current X5 in 2014, and its replacement is due this year. 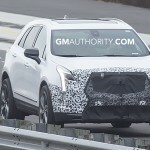 Cadillac introduced the XT5 in 2015, so a replacement could be put out in 2019. GM executives have already commented that vehicle life spans would be decreasing in the future, particularly popular models (crossovers, i.e. XT5). This very well could be an XT5 replacement, especially when you have JDN wanting to get his own products to market. Yes, but the XT5 went on sale in March of ’16 as a 2017 model. The XT5 is not getting a brand new altered model, trust me. JDN don’t have that much power for a brand new model for ’19. A second generation model will be available past ’22+ or around that time frame before than past ’21. A refresh could happen for ’20 model year. If a vehicle have a lifespan of just two-three years with a brand new design generation after another, could you image the operating cost out the door with suppliers and etc.? It would be way too expensive for automakers to possibly earn their money back, let alone a profit. However, I do see what you are talking about because the previous Malibu had a lifespan of just three years for consumer purchase while that design is continuing as fleet only, as Malibu Limited. However, the Malibu was a different story though. It is clear it is a mule for the new mid engine Cadillac……..Just kidding. It is for sure a mule under a body that is not planned for it. GM has done the Mule under other bodies often. The Corvette has been under previous bodies and has even been under a Camaro. the CTS was under an ATS etc. Many times we see these vehicles and never know the true under pinning’s of it. The Six lugs are what this platform already has and it was never the same as the XT4 platform. The exhaust is similar to the present exhaust and almost looks like the length of an Acadia pan as it is just a shade longer. This would give them the ability to use a 3rd row in it the XT5 lacks. I would love to know the wheels size. Also note that they stick out in the back a bit and are not fully under the body. 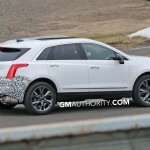 My guess is the XT5 is going to grow a bit or it is a whole new model under the skin. The XT5 was not a JDN model so he could be replacing it with a longer model similar to the Acadia. Or he could be doing a totally new model to fill the gaps. I was at the auto show yesterday and the lack of people around sedans was very telling. But you had to wait in line to get in a CUV or SUV. Test drives left sedans mostly parked as the SUV and trucks rolled. The impact of how the market is turning away from sedans was telling. It is sad but I could have sat in the Lacrosse all day. Even the Regal had few spectators. Test drives left the Malibu and Cruze parked. Cadillac is doing the right thing loading up on these SUV models. But even now BMW is marketing a $36K package on a model now so this will be a competitive segment. There you go. A good Samaritan’s job is never done. 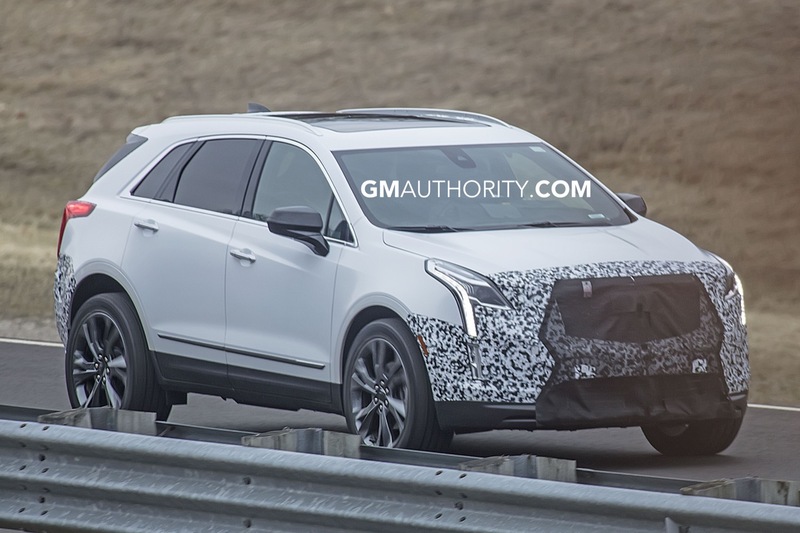 The segment is wide anymore and Cadillac will have it converted with CUV, SUV or WTF. The point is I saw first hand how the car segment is dying faster than I had anticipated. The future will be very different indeed. It wouldn’t be the first time a crossover grew just a little without changing names or generation under JDN, the 2015 Infiniti QX50 was a bit larger than the previous year but it wasn’t new just extended. Might have been one of the few things he did as head of Infiniti before coming to Cadillac. Another thing to consider here is this may not even be a Cadillac. They could have just slapped a Cadillac body on another models mule. Remember the mid engine Corvette mules also used a Holden Ute body and they even used a Malibu to test the drivetrain. The Traverse also has 6 lugs. This has to be the longer wheelbase XT6. Takin a closer look it seems this car has a similar grill to the one on the XT4 mule. I recall the XT4 had aggressive sport rims early on in the spy shots. Don’t recall if the grill/rims were on the same setup tho. This could be a V/V-sport model testing? This is a mule for C1TL; which is larger than existing C1UL and upcoming E2UL. I can imagine an engineer, with all seriousness, drafting the model for the wheels off some ridonculous photoshop.